Roasted Chicken Breasts are a staple in our home, because they are so easy to make and everyone loves them. 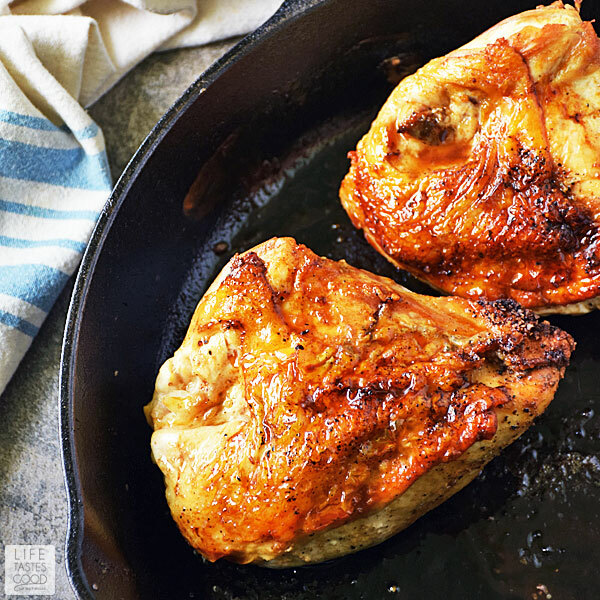 Doing a quick pan sear and finishing the chicken in the oven gets the skin nice and crispy, while the chicken stays tender and juicy with a deliciously roasted flavor that's hard to resist. This quick and easy recipe is perfect for back to school dinners and sure to be a regular on your dinner table! The kiddos are heading back to school. It can be such a hectic time of year with homework and after-school activities, so the Sunday Supper Tastemakers are sharing their favorite Back To School Dinners to help you with meal planning. Need more easy recipes to get you through the busy back to school time of year? Check out Life Tastes Good's collection of easy recipes. I always roast the chicken breasts with the bone-in and skin on, as that is what gives them flavor and makes them juicy. If you try this recipe with skinless, boneless chicken breasts they will be tasteless, dry, and just plain icky! Another reason to use bone-in and skin-on is to make your wallet happy. Buying boneless, skinless chicken breasts costs so much more, so save your pennies and eat flavorful, juicy chicken! It's a win-win!! This recipe is for cooking 2 chicken breasts. You can double, triple, or make however many chicken breasts you like but keep in mind, they might not all fit into the skillet. 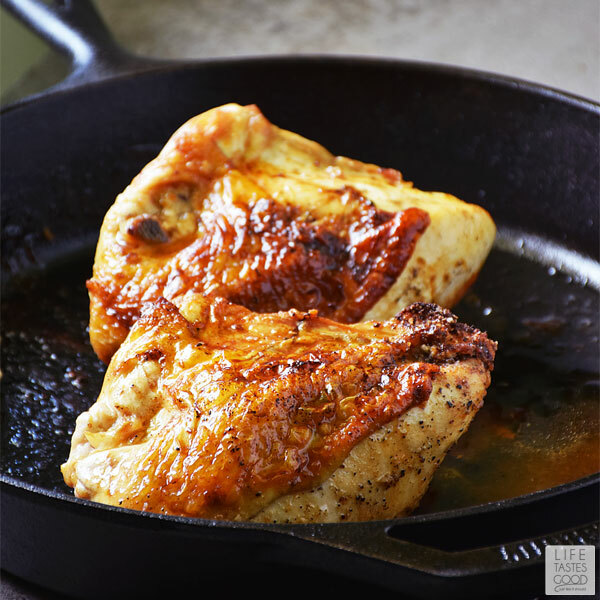 If you are making more, be sure to use a larger skillet or sear the chicken in batches and place them on an oven safe rack set inside a baking sheet to finish cooking in the oven. For those busy nights, serve this up with a simple side salad and your favorite dressing. If you have a little more time on your hands, whip up some garlic mashed potatoes and some steamed vegetables with garlic butter. This quick and easy recipe is sure to be a regular on your dinner table! Preheat the oven to 450°F. Remove chicken from fridge about 30 minutes to an hour before you cook it. Dry it off and season it. To season, combine 1/2 teaspoon kosher salt, 1/4 teaspoon pepper, and 1/4 teaspoon garlic powder. Mix well. Gently lift skin from the chicken and sprinkle half the season mixture onto each breast under the skin. This will get the seasoning directly on the chicken meat. Put the skin back in place. Heat a 10" cast iron skillet (use an oven safe skillet) over mid-high heat and add 1 tablespoon butter. Place the chicken breasts in the skillet with the skin side down and leave them for 3-4 minutes. DON'T MOVE THEM AROUND! It's important to just set the timer and leave the chicken breasts alone so the skin can get nice and crispy. When the chicken breasts are seared nicely, use tongs to flip them over. NOTE: the skin will release easily for turning when it's nicely seared. If the skin is sticking, then turn up the heat a bit and let it sear until it releases from the pan. Place skillet in the preheated oven and cook for 25-30 minutes or until internal temperature reaches 160°F. Use an instant read thermometer to check the temperature in the thickest part of the chicken without touching bone. 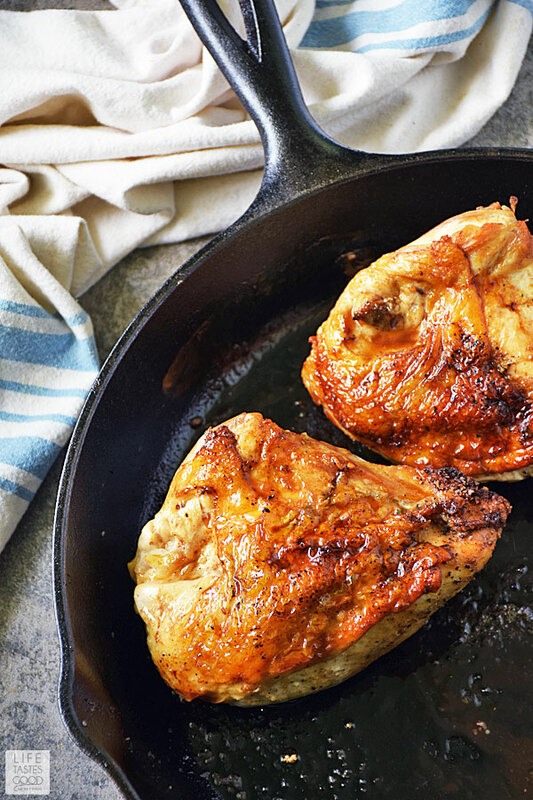 When the chicken is cooked through, remove the skillet from the oven and allow the chicken to rest for 10 minutes. Be very careful handling the skillet. It is HOT! I always place an oven mitt on the handle to remind me not to grab it. Enjoy! This looks delicious! I hope you'll join us on Foodie Friends Friday this week and perhaps share this yummy recipe! Such a simple, yet fabulous recipe! Cooked to perfection. These look so juicy and delicious! 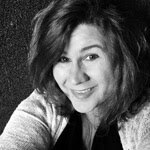 A winner for sure, Marion!